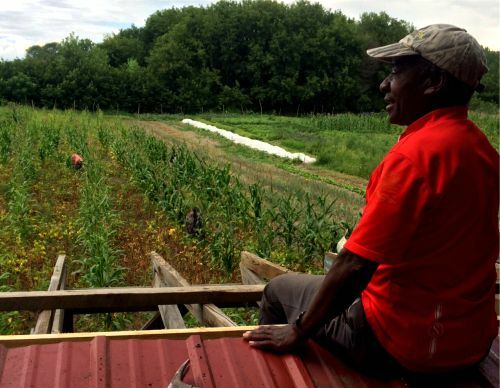 In 2010, New Farms for New Americans (NFNA), a program of Association of Africans Living in Vermont (AALV) started recruiting farmers and gardeners into their agriculture program with the help of a Refugee Agriculture Partnership Program (RAPP) grant from the Office of Refugee Resettlement. The grant was meant to help connect refugee and immigrant farmers to land, resources, and education related to business development for small-scale farming and markets. The goals of this grant helped launch the Burundian Farmers Co-op. Farmers Francois Gasaba, Maria Kamikazi, and Hadija Petro joined the NFNA program in 2010. After receiving assistance and mentorship through NFNA for five years, Francois, Maria, and Hadija officially established the Burundian Farmers Co-op and started selling small wholesale amounts of crops, and City Market is proud to be one of their accounts. The Burundian Farmers Co-op is cooperatively owned by husband and wife Francois and Maria and their friend Hadija. The cooperative structure of the business is not typical in their home country of Burundi, however this structure allows them to increase production and share the costs of doing business (such as insurance, delivery fees, etc). The Burundian Farmers Co-op grows their crops on land managed by NFNA located in the Intervale. They grow culturally specific crops, like okra, callaloo (pictured above), and jicama, but they also grow American staples, like green beans and cucumbers. UVM Extension has worked closely with the growers to provide marketing assistance and business enterprise support. For example, they produced a video with Francois and Maria at City Market to inform other New American growers about the importance of building relationships with buyers, and they produced a growing guide for African and Asian crops in Vermont. UVM Extension has also worked with the growers to tackle pest management and soil fertility. Francois, Maria, and Hadija are now also helping beginning New American farmers in the NFNA program by providing mentorship and sharing knowledge about growing conditions in Vermont. City Market has worked with NFNA over the years to purchase crops from participating farmers, and we’ve now worked with the Burundian Farmers Co-op for the past 3 years. Because the Burundian Farmers Co-op is still small-scale (in terms of a wholesaler), we have a very flexible working relationship with them. When they have a crop that they want to sell, they let us know and we purchase it from them to make it available to our Members and customers. This flexibility is really unique to independent stores like City Market. Being an independent, autonomous store allows us to focus on supporting local growers and to bring in items for a short period of time when they are locally available. Demand is growing for culturally specific foods, both in a retail setting and at restaurants, so we’re excited to be able to work with the Burundian Farmers Co-op to bring these products to you!